Meal prep is a great way to stay on track when it comes to healthy eating. 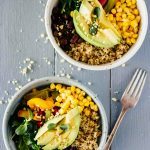 Make these delicious Vegan Meal Prep Black Bean Quinoa Bowls in advance and have them ready-to-go throughout the week! The weekend is finally upon us (hallelujah), and I’m very much looking forward to a somewhat restful weekend at home. This weekend’s plans include hanging out with friends, lots of pizza (gluten-free and dairy-free for me because I’m currently testing for allergies), working out, church, and baking a cake with a friend for her daughter’s birthday party. Anyway, glad I didn’t go that route in life! 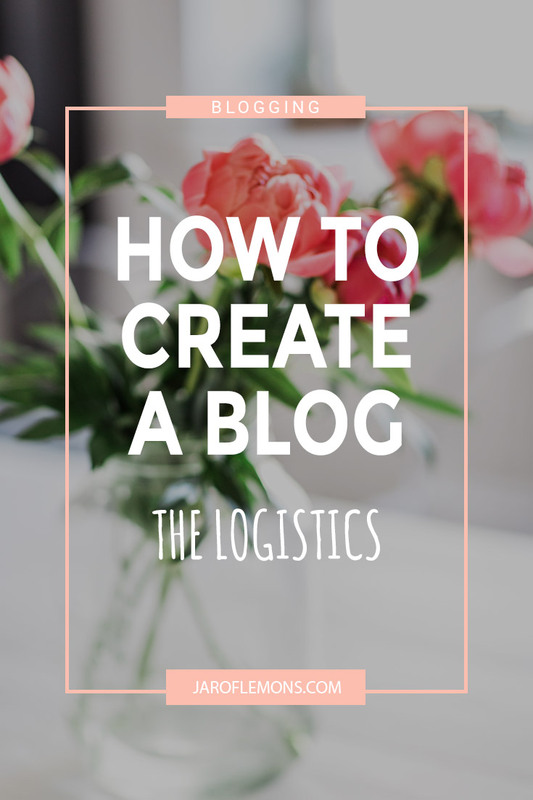 Lesson learned, some hobbies don’t need to turn into a business. And I’m grateful to still be able to do it as a hobby! Also, (#RealLife) I never would have been able to control myself around all that sugar if I had owned a bakery. Let’s be honest. If you own a bakery and have self control, you’re a rockstar. I just love sugar WAY too much! Which brings me to this life changing point: meal prep is everything!!! For the most part, running this blog forces me to meal prep because I’m constantly making healthy recipes and photographing them in advance. But even before I started Jar Of Lemons, meal prep was a way of life for me! Mainly because I knew myself, and if I didn’t meal prep, I knew I would most likely make bad nutrition decisions on the fly. I mean, I’m obsessed with fried stuff and sugar. I KNOW myself, haha. If you’re a junk food lover gone healthy, I’m so glad you’re here and that we can relate on this crazy topic. Much love for you, dear friend! These Vegan Meal Prep Black Bean Quinoa Bowls are perfect to pack up and take on-the-go! They’re also (as always, with Jar Of Lemon’s recipes) super easy to make. The only cooking required is the quinoa, sautéed spinach, and fajita veggies! Everything else just get’s thrown together and packed up into meal prep containers (<—-love these!). And if you’re looking to bring more meal prep into your life, you MUST check out A Month Of Healthy Eats For The Busy Girl! 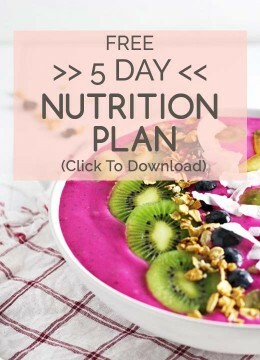 It’s such a great resource if you’re wanting to plan out meals and really get serious about eating healthy. The approach is realistic, which means simple/easy recipes, common ingredients, and efficient workouts. 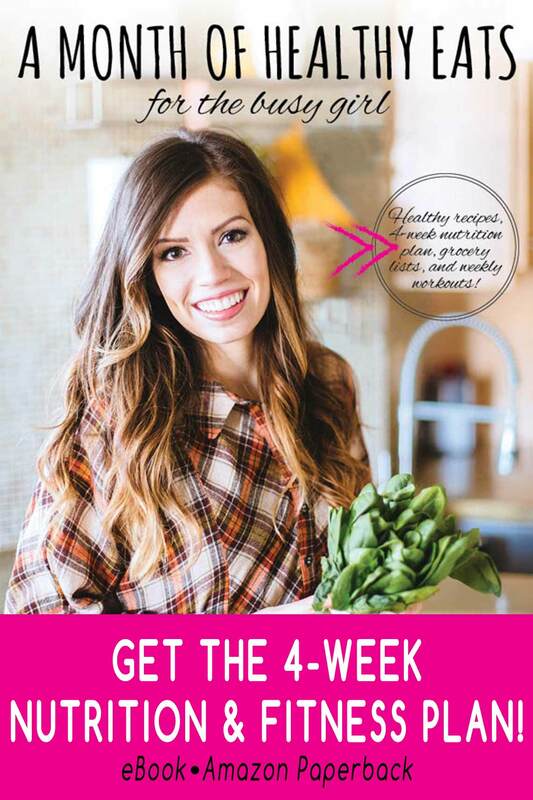 4 weeks of planned out meals, workouts, grocery lists, 20+ recipes, and tips for eating out are all included in this book! It’s a great way to start meal prepping and making healthy, delicious recipes (like these Vegan Meal Prep Black Bean Quinoa Bowls)! I used frozen fajita veggies because, well, LIFE. But feel free to use fresh if you would prefer! I’m always all about canned organic beans and canned organic corn. Trader Joe’s sells them for a relatively lower price, and they’re the best! This recipe creates 4 meals, but feel free to adjust! A serving of this recipe for Cody is about 1.5 of the serving I would eat, so sometimes I double up servings for his meal (or add tortilla chips, hehe). That’s it! Enjoy the recipe, friend! While the quinoa is cooking, sauté the spinach. Next, heat up the fajita veggies. Fill each meal prep container (or each bowl) with quinoa, black beans, corn, spinach, fajita veggies, corn, and avocado. Refrigerate for later or serve immediately! If you leave the avocado out (until you are ready to serve), they should last about 2-3 days. Enjoy the recipe! What is each individual serving size?